Comprehensive education in higher Buddhist Studies. Experience a rare and precious opportunity. 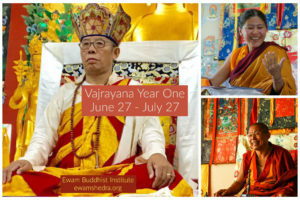 Year one of our two year shedra program on the Vajrayana which will cover all six classes of tantra. Sang-Ngag Rinpoche will begin our summer program with the Guhyagarbha empowerment and teachings; thereafter the shedra will be taught by Khen Rinpoche and Jetsunma. Year one will cover 5 of the Buddhist classes of tantra; Kriya tantra, Charya tantra, Yoga Tantra, Mahayoga and Anuyoga. Year two will be on Ati Yoga or Dzogchen. This is an extremely rare opportunity to learn everything about tantric Buddhism you have ever wanted to know. This will be an in-depth and detailed analysis of the tantric path almost never extensively elucidated in the west. 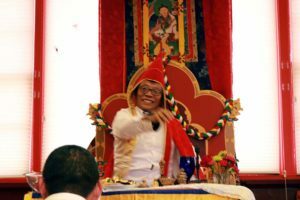 Students will attain a profound and sophisticated understanding of the lineage, theory and methods of the Vajrayana path. 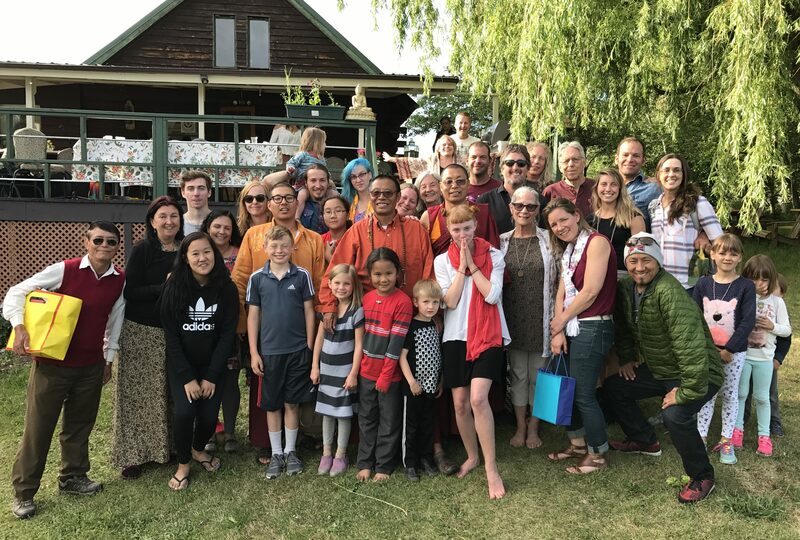 Thru such great masters of our lineage these teachings come to the garden this summer; from Indian masters, Guru Rinpoche, Longchenpa, Jigme Lingpa, Dilgo Khyentse, Sang-ngag Rinpoche to our two main shedra teachers Khen Rinpoche and Jetsunma. Join us this summer for this precious time of inconceivable understanding and blessings at the Garden of One Thousand Buddhas. This program will not be offered on-line or available in any way except by being onsite. These teachings will not be recorded and no one will be permitted to record any sessions. Students must commit to attending all sessions on time without exceptions, partial attendance is not possible. 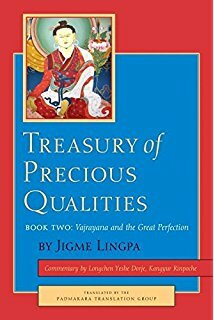 Our main text is volume two of Treasury of Precious Qualities by Jigme Lingpa (Shambhala Publications, 2013) with commentaries by Kangyur Rinpoche and Dilgo Khyentse Rinpoche in addition to the extensive oral teachings and pith instructions of our teachers. This year’s shedra will be held in a strict retreat format in order to achieve the greatest possible benefit. The schedule is 9 – 5 daily, an occasional day off of rest and study will be offered if time permits. I’ve been living in America for many years, and in those years, we’ve done a great amount of work. We created many representations of the Buddha as you can see in the Garden of a Thousand Buddhas. 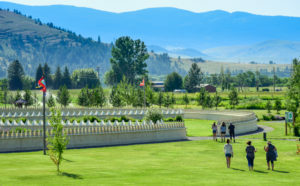 This was created as a place to bring people together, as a place of pilgrimage. 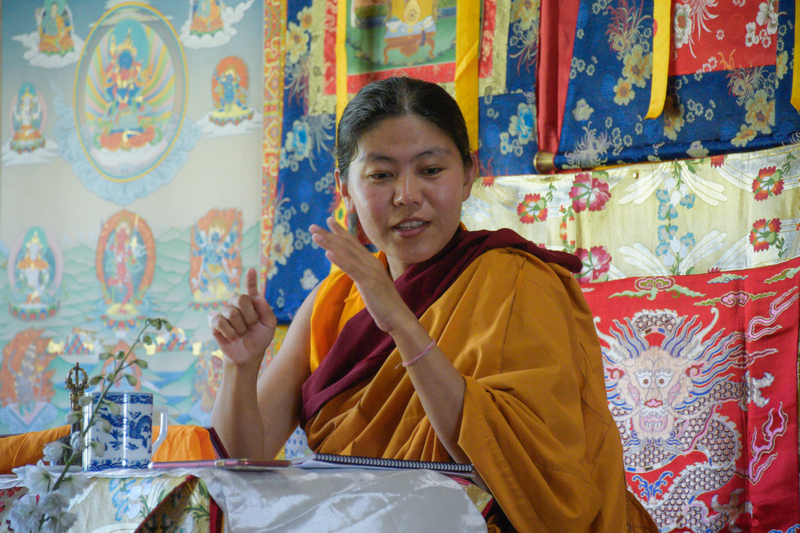 The primary reason for gathering here is to study and practice the Dharma. The teachings of the Buddha are divided into those of scripture and those of realization. The dharma of scripture is the subject of shedra. I would like to say Tashi Delek and express my thanks to the Abbot of the shedra, Khen Rinpoche, the sponsor, and to all of you who are attending. The dharma of realization is that which is accomplished in your practice. Today, I am just finishing teachings on Yeshe Lama and in it there is a discussion of the bardo of becoming, in which it is said that hearing the teachings is of primary importance. Hearing, or study, is said to be the eliminator of the darkness of unaware ignorance. All of you should be working hard in study, contemplation, and meditation. We must accomplish the three—hearing, contemplation, and meditation. The text which we will be studying is the Treasury of Precious Qualities, a text which completely and unerringly presents the paths of the beings of three capacities and the nine vehicles, beginning with the exposition of the difficulty of attaining a human birth and continuing all the way to the Luminous Great Perfection. It will be very virtuous and beneficial if all who are attending the shedra don’t merely listen to the teachings, but ask questions and apply what you are learning to your practice as much as possible. In that way, our study and practice will be like a lamp which illuminates the darkness, like the sun rising to light the morning. Together with how the Dharma is spreading all over the west, we should join in and add to the spreading of the teachings and practice of the traditions of sutra and tantra and bring peace to this world. So, it is extremely important that we establish this shedra. We can practice on the basis of our hearing and cutting through our doubts and misunderstandings with contemplation. Without knowing anything, there can be no practice. This is really important, so keep it in mind. This text was taught by Dilgo Khyentse Rinpoche at Shechen Monastary every year as one of their most important texts to study. It is not just an intellectual exercise to study this work. Jigme Lingpa’s text is a manual for exactly how the great bodhisattvas and Buddha’s have realized the wisdom of Buddhahood so you too may be able to accomplish the same. This two volume work covers all nine yanas of the Buddhist path according to the Nyingma School of Tibetan Buddhism. 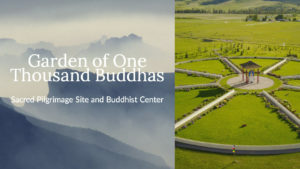 Patrul Rinpoche said to hear one word of this text would place one on the path to great understanding and to study the whole text would lead to the full realization of the Buddhist teachings. 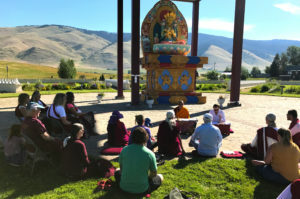 The school will be conducted at the majestic Garden of One Thousand Buddhas in Montana, “the Bodhgaya of the West.” Classes will be held daily from 9:00am-5:00pm. Cost for the entire program include all the teachings, 3 meals a day and accommodations. We have two fees depending on your ability to pay and also a limited number of financial aid packages that can pay up to half of your tuition price if you meet our lower income guidelines. Camping $950 and $1,100 (includes use of the sangha house) - Shared room $1,300 and $1,500. Registration information will be sent upon being accepted to the program - email info@ewamshedra.org with any questions.